Another innovative first from SafetyBanners.Org. Our Fire Extinguisher Sign with PASS Extinguisher Use was developed in-house and is manufactured solely by SafetyBanners.Org in Memphis, Tennessee. 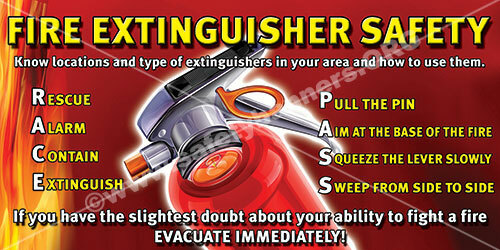 CLICK HERE to Order our Extinguisher Signs. Our fire extinguisher sign comes in two sizes and four different material configurations. A - Our well received Wall Sticker. It is totally removable, will NOT damage the surface and sticks to almost anything - even cinder block. C - 2-Way mounted double sided sign with easy mount mounting hardware. It flexes when struck. Consistency of your fire extinguisher use plan is absolutely vital to proper use when a fire emergency occurs. Make our easily seen fire extinguisher signs WITH HIGHLY VISIBLE PASS USE INSTRUCTIONS a part of your fire safety plan. Most fire extinguishers have some sort of use instructions on them. BUT, when there is a fire you do not want your employees searching the fire extinguisher for use instructions. They are almost always difficult to read and understand in an emergency. Try it with YOUR fire extinguishers. It is not easy when you are in an emergency. Our fire extinguisher signs with the PASS USE SYSTEM ON THE SIGN makes it EASY for you employees to read and use the fire extinguisher use instructions in an emergency. Another innovative first from SafetyBanners.Org. All fire extinguisher images and designs are the copyrighted property of SafetyBanners.Org, all rights reserved, and shall not be reproduced without written permission. Designed and made in America.